H&M AW2016 women's collection is abot Female Power, Floklore Romance. This is an elevated collection of individual pieces rich in detail, from the precision of cut to the embroideries that appear throughout. 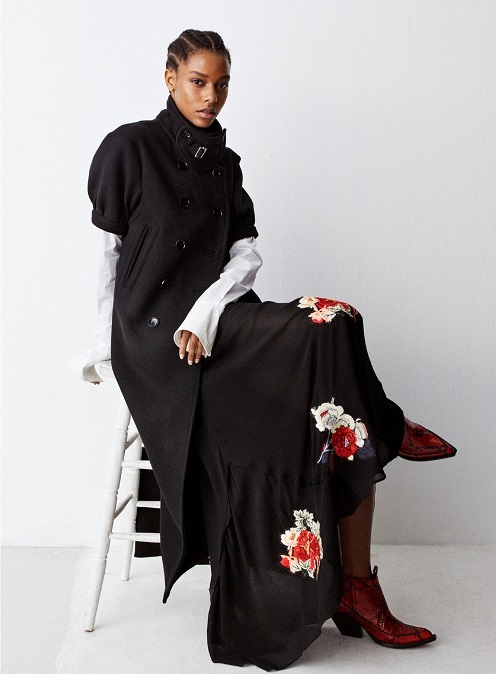 Tailoring has oversized shoulders and a fitted waist, an hourglass shape which contrasts with Swedish folkloric influences in both silhouette and embellishment. Meanwhile, long-sleeve draped dresses bring glamour and softness. “There is a new femininity in this H&M Studio collection. It’s about female strength and power, with a fresh look at folklore and romance. It’s very elevated, and also very real,” says Ann-Sofie Johansson, H&M’s creative advisor. 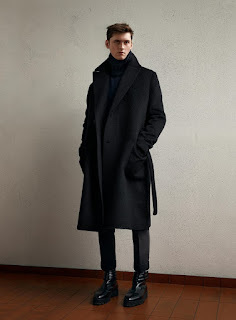 The themes is about powerful tailoring that creates an hourglass silhouette from an oversized shoulder and fitted waist in both coats and jackets. Swedish folklore inspires silhouettes, prints and embellishments, such as folkloric blouses, or a long sheer dress printed with the Swedish lynx. 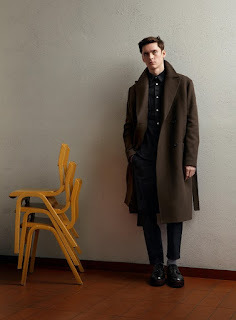 Coats play with shape, from oversized utility styles that wrap the body, to double-breasted wool coats with a rounded short sleeve. Crisp white shirts are a wardrobe essential, especially with exaggerated sleeves, while lace brings femininity with layering slips. Pants are cut high and fall wide, pooling at the feet. A contrast of materials reveals the complexity of character, from shearling coats to velvet tailoring. Long-sleeved dresses follow the line of the body to the floor, like the blue velvet wrap dress with a pinstripe of silver lurex. Silver chain embellishments bring attitude to night, both creating embroidered patterns as well as being left loose for fringing. Wool for coats, as well as a broken pinstripe tailoring wool for suits. Lace is perfect for a long dress, tops and in folkloric blouses. Velvet brings softness to tailoring, as well as glamour to a long draped dress. Shearling adds contrast and a sense of Swedish heritage. Cotton gives crispness to white shirts, allowing them structure and fit at the waist, as well as volume in the sleeve. Corset stitching creates a shaped waist, rich embroideries evoke folkloric patterns, beading and crystals add three-dimensional embellishment. Black, red, white, blue and a variety of neutrals. For Men's collection, “It started with the qualities,” says Andreas Lowenstam, H&M’s head of menswear. “These fabrics had such character, we knew we wanted to create a collection that focused on the perfect coat.” It’s an elevated, intuitive style that takes an updated look at menswear classics. The bomber is elongated to create a new outerwear garment. The car-coat is reborn in recycled wool. 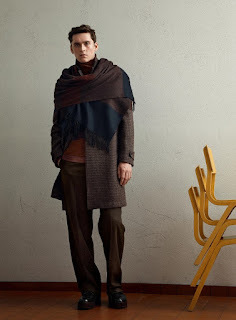 Traditional fabrics such as corduroy are cut into utilitarian shapes. Knitwear becomes the essential layering piece of the season. Outfits are often monochrome, giving the sense of a new uniform for city life. “I love how the collection makes such a statement from pieces that are so calm. You can make a strong look from elevated classics, especially when all the details have been considered so deeply,” says Andreas Lowenstam. coat in dogstooth. Knitwear is crucial, especially the cashmere/merino wool turtleneck with a pattern of irregular rib like a deconstructed cableknit, or fisherman’s turtlenecks with rib fronts. Pants are tailored to a variety of lengths and styles. 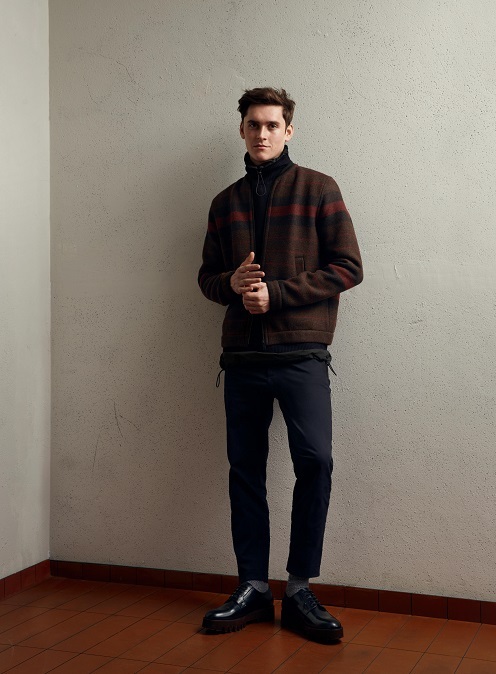 Straight cut corduroy pants match the corduroy bomber, while wool pants are the perfect match for this season’s coats. 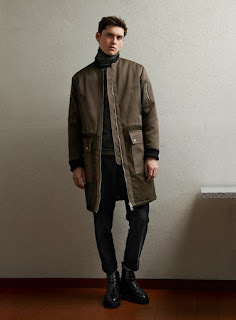 Functionality adds a utilitarian edge, like the zip-up fleece jacket, or a nylon vest with pulls at the waist for layering. Every detail counts, like the T-shirts and fine rollnecks in silk and pima cotton, or the accessories, like mohair beanies, wool scarves and leather shoes with platform tread soles. 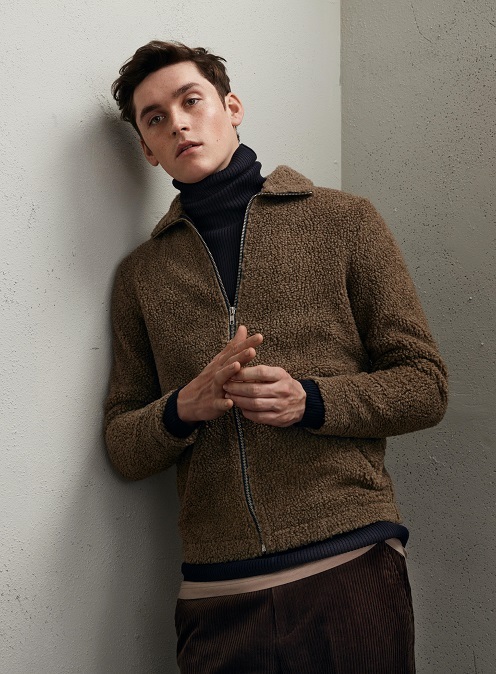 Recycled wool; cashmere/Merino mix; corduroy; nylon; silk/pima cotton mix are used in this collectioon and qualities are key, from the silhouette-forming stature of recycled wools for coats, to the texture of brushed wool for a belted coat. 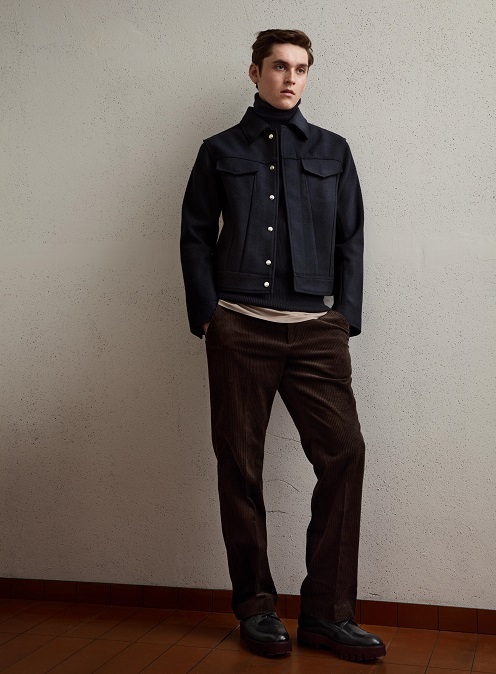 Jumbo corduroy gives a retro feel to contemporary garments, especially when cut into a bomber jacket, or contrasted with nylon for the extended bomber. 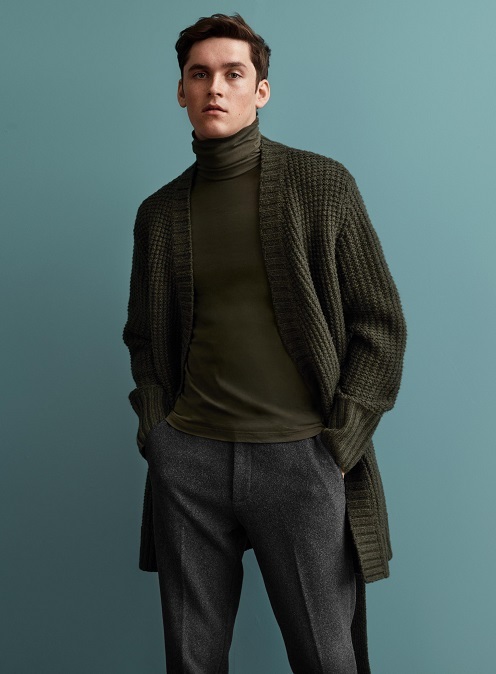 Knits have personality, from the texture and shine of a chenille turtleneck, to the boatneck of a fisherman’s navy sweater that’s almost like an outer layer on its own. Uniform green; brown; midnight navy; grey; mole, off-black.